The following is a reference / historical listing of the 70-millimeter presentations of “Far and Away” in North America. The film’s 70mm prints consisted of full-frame imagery sourced from Panavision System 65 (65mm) photography. The audio was Six-Track Dolby Stereo. “Far and Away” was among ten confirmed first-run films released in 1992 with 70mm prints for selected engagements. One-hundred sixty-three 70mm prints of the film were reportedly struck for distribution in North America, which places it among the industry’s ten-highest large-format print orders in history and the highest in Universal Studios’ history. The Brian Grazer/Imagine production and Universal release — directed by Ron Howard and starring Tom Cruise and Nicole Kidman — opened May 22nd. For the release of “Far and Away”, Universal employed the services of Lucasfilm’s Theater Alignment Program (TAP) to evaluate and approve the cinemas selected to book a 70mm print. Trailers for “Housesitter” and “Death Becomes Her” circulated with the “Far and Away” prints and which the distributor recommended be screened with the presentation. 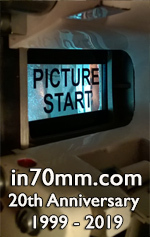 Many of the following 70mm presentations were also shown in a sneak preview screening on May 9th and/or 16th. This information has been principally referenced from film industry trade publications and regional newspaper promotion, with thanks to Laura Baas, Seth Bartoo, Don Beelik, Don Beelik, Deb Bier, Shelia Bumgarner, Jason Burks, Raymond Caple, Scott Clark, Andrew Crews, Saundra Cropps, Kathryn Devine, Kimberly Diebolt, Heather R. Edwards, Christine Filippelli, Debbie Gallagher, Anna Gooding-Call, Beverly Gray, Nicholas Grieco, Katie Grzech, Sheldon Hall, Wendy Hall, Thomas Hauerslev, Bobby Henderson, Matthew Vasquez Jaquith, Matt Kendall, Sarah Kenyon, David Kilmon, Anna Kimball, J. Klamm, Bill Kretzel, Ronald A. Lee, Mark Lensenmayer, Sarah Lubelski, Stan Malone, Linda McFarland, Gabriel August Neeb, Hannah Q. Parris, Charlotte Pendleton, Sophia Petrakis, Joe Redifer, Stephen Rice, Nina Sappington, Bob Sawatzki, Melissa Scroggins, Desirée Sharland, James F. Shearhouse, John Siegel, Tim Spindle, Cliff Stephenson, John Stewart, J. Michael Stubbs, J. Thomas, Robert Tucker, Enrique Valdivia, Troy Valos, and Brian Walters.